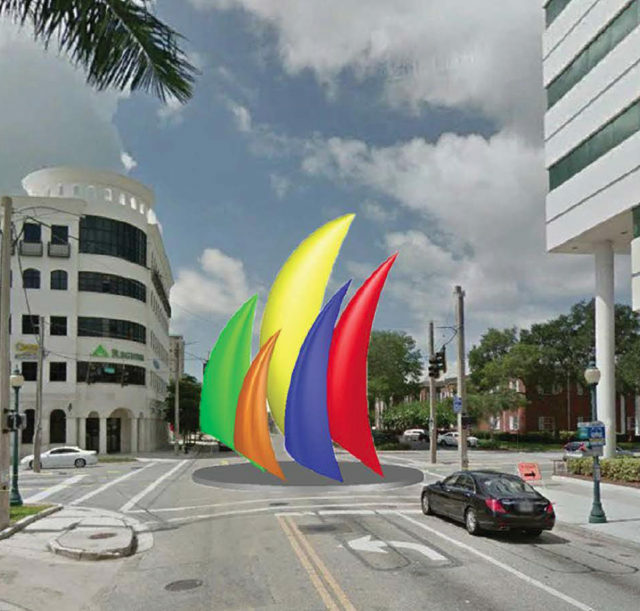 With Commissioner Susan Chapman casting the only “No” vote, the Sarasota City Commission on Dec. 5 accepted its Public Art Committee’s recommendation to put a sculpture by city resident Jorge Blanco in the center of the planned roundabout at the intersection of Ringling Boulevard and Orange Avenue. Chapman objected to the design of the artwork in what she called the “context of some of the classical buildings” at that location. While the nearby PNC Bank tower is more modern, she said, the Federal Building on one corner and the Williams Parker law firm’s home — which reflects “more of a Georgian style” — contrast sharply with the piece called Bravo! Chapman indicated. “It’s an interesting corner there,” David Smith, general manager of the city’s Neighborhood and Development Services Department, responded. The two newer buildings at the intersection are more modern and taller, he noted. “The Public Art Committee did take [the look of all of the structures] into consideration,” he said. “It goes with the one building rather than the other three,” Chapman replied. “Then you have the contrast,” Weisman said. The backup agenda material for the Dec. 5 meeting says the Public Art Committee members voted 5-0 to award the commission to Blanco. Weisman explained that the group had narrowed the entries to 10 and then to three. The other two finalists were Brad Connell’s Horizon and Nnamdi Okonkwo’s Unity. The roundabout construction tentatively is planned to start in the spring of 2017, Jan Thornburg, the city’s senior communications manager, told The Sarasota News Leader. Bravo! will be approximately 16 feet tall and weigh 1,200 pounds, according to the statement Blanco submitted with the entry. “Through this work I am trying to express the vibrant spirit of music, dance, visual arts and theater with a personal iconography representing movement, color, rhythm by using simple but bold geometric forms and bright colors interlaced with white and/or polished metal,” Blanco wrote. 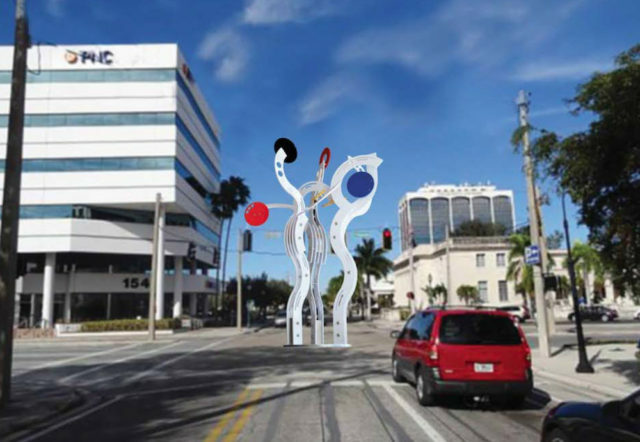 Because Blanco lives in Sarasota, Weisman told the board, the artist will produce the sculpture in the city, which will generate revenue in the community. The total commission for the project is $150,000, but Smith said that only about $25,000 or $30,000 would go to Blanco. The rest would be put toward the manufacturing of the piece, its transportation and its installation, among other expenses, he added, though he did not have the exact breakdown with him at the meeting. ‘The city would pay for the base,” Smith told the board. “It seems like we have a lot of public art from this particular artist [in the community],” Chapman noted. 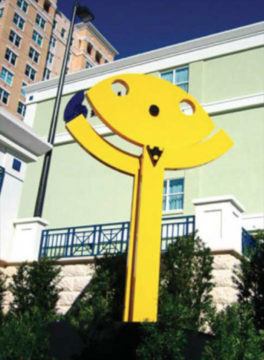 The city’s senior planner, Clifford Smith, responded that Blanco’s Smile is at the intersection of the Boulevard of the Arts and U.S. 41, while The Runners sculptures are in the median of U.S. 41 in front of the Municipal Auditorium. “I guess maybe it’s a statement toward his skill, that the committee voted for him,” Weisman said of Blanco. “Or everybody likes cute-sy stuff,” Chapman replied. Furthermore, Atwell said, drivers will be able to see around the elements of the sculpture as they traverse the roundabout. When Mayor Willie Shaw asked for a motion, Commissioner Liz Alpert called for the board to accept the sculpture; Atwell seconded the motion. I like modern art and sculpture, but think the two pieces shown are “kitschy,”/”cute.” The sail piece not selected is too big for the site, if proportionally correct, but a more serious statement, related to the waterfront.